Anyone who has seen the movie Jurassic Park knows just how adept Silicon Graphics' computers are at manipulating graphic images. Using a process called morphing, which seamlessly transforms one image into another, the company's high end computer workstations helped to achieve many of the film's special effects. Recognizing that forecasting the requirements of a rapidly changing business is about as easy as predicting a smash hit at the box office, it was only logical for the computer maker to extend the concept of morphing to its own operations. Virtually on demand, an extremely flexible conveyor assembly line and automated storage and retrieval system (AS/RS) can handle a completely different product mix or volume. Products can also be customized on the fly. To most materials handling professionals, the idea of flexible automation probably sounds like a bit of an exaggeration. Until recently, automated materials handling systems were just as likely to conjure up the image of a hulking oil tanker: Lots of ballast and oil and difficult to change direction quickly. Even the designers of the new system were concerned that automating parts of the process would cause them to sacrifice much of the flexibility they had enjoyed in the past with a manual system. "Though our volumes were getting to be pretty substantial, we were running the operation more like a job shop," recalls Jim Mullen, industrial engineer. Producing lot sizes of just one, a job shop isn't typically locked into the scheduling constraints of a larger, more capital-intensive operation. But having a process with a high content of direct labor did have its drawbacks. Workers basically manhandled the product at several points in the process. Not only did this waste time and involve long travel distances, but management was also getting anxious about all the manual lifting involved. "Some of our new, high end products were getting to be on the heavy side, 40 to 45 lbs, for somebody to be lugging around," Mullen recalls. Another snag in the process was product burn-in, which is a quality control procedure that involves testing of the fully assembled computers at an elevated temperature. A typical shop can build a complete computer in a mere 30 minutes or so. But burn-in, which is the next step in the process, requires anywhere from 10 to 48 hours. Not surprisingly, a bottleneck at this point can cause some pretty significant delays, not to mention the fact that it can limit the ability to respond to changes in production schedules. "It was always a juggling act for us, because we could only test cer tain products in certain burn-in chambers. It really limited our capacity," says Mullen. "It wasn't uncommon to see two or three days worth of work-in-process start piling up, just waiting for an open slot." "So I guess you could say that with the new system we wanted our cake and eat it, too," says Jeff Korcan, director of manufacturing engineering. "On the one hand, we wanted to eliminate the problems we had, and we knew that automating elements of the process would ultimately help us gain better control of our inventory and costs. But on the other, we wanted to preserve the flexibility that we had." As the system designers began to explore possible equipment alternatives, they knew they had their work cut out for them. Corpo rate directives typically only make things worse. But in this case the order to design a system with three times the capacity in a space 10% smaller than before actually helped to simplify their task. "At $60 a square foot, the cost of fully burdened space here in Silicon Valley is among the highest in the nation. So it wasn't too surprising that company management wanted to conserve our use of space if possible," says Korcan. "Having a fixed footprint of roughly 100,000 sq ft forced us to be conservative in our design. Ultimately, we wound up choosing proven technologies that really made it possible for us to achieve the flexible system we wanted." The conveyor portion of the system consists of a main line (called the highway) that provides point-to-point transport of product and serves three assembly lines with 39 workstations. Mechanical lift and transfer devices are used to move the transport pallets, which carry the computers through the assembly process, to and from the workstations. Unlike similar conveyor systems, which are hard fixed to the floor and essentially require a complete redesign when requirements change, the individual elements in this system are highly reconfigurable. Mullen points out that not only can any of the assembly lines handle any type of product, but the modular workstations themselves are interchangeable. Any job can be performed at any station. And each station, which features self contained addressable controls, can easily be physically relocated as needs dictate. Many conveyor-based systems automatically imply fixed flow, but this flexible system allows Silicon Graphics to change its entire manufacturing mix and capacity overnight. Product travels on a transport pallet down a main conveyor highway and through a series of modular workstations where various assembly and test operations are performed. After assembly, product enters an AS/RS for burn-in testing and then travels back through the flexible assembly areas for final checkout and testing. "We just unplug the workstations, unbolt them from the conveyor and in about five hours we've got the system up and running in a totally new configuration," says Mullen. "The best thing about the design is that the software control system automatically recognizes which stations have been moved and where they've been moved to." With volumes growing at more than 30% a year and a product mix that is continually shifting, that capability has already been tested. "We don't want to make a habit out of it, but we have reconfigured the lines a few times," says Mullen. "We also have the capacity to add about 20 more workstations to the 39 we have, which means that despite our rapid growth, we should be able to live with this system for a long time to come." The bar-coded transport pallets used to track and carry work-in-process through the various assembly operations were also designed with flexibility in mind. Constructed of cast aluminum with a multi-position turntable surface, each pallet has locating pins to accommodate the nine different chassis types Silicon Graphics currently produces, and then some. "We tried to design both the conveyors and the pallets to what we think is the maximum size product we might build in the future," says Mullen. Just what that size will be is anyone's guess, but given the downsizing of today's computer systems, it's a good bet that the system will be able to handle almost any new product. For greater flexibility in the production process, the conveyor provides an electrical contact to the pallets, thereby allowing online testing of the computers. Because the workstations are essentially portable, a buss bar system accepts contact plugs at any location along the length of the conveyor. Like a boat going into a slip, the transport pallet enters into a workstation, at which point a worker simply plugs a cable on the pallet into a connector on the computer. The fact that all of Silicon Graphic's computers feature a universal connector enhances flexibility further. Working with the limited floor-space was a particular challenge for the designers. In an effort to keep as much of the space free for pedestrian walkways and aisle space, the team opted for a network of ceiling-mounted, zero pressure accumulation conveyor located 15 ft above floor level. Although designers would have liked to use incline belts (for their reliability) to carry product to the ceiling, the space could only accommodate two pairs of vertical lifts. "Actually the lifts have really worked out well for us, because we can take one product off the system as we're putting another on," explains Mullen. "The throughput is really outstanding." A high-density, automated storage and retrieval system (AS/RS) that doubles as a fully automated, burn-in testing system also takes advantage of the available overhead space. 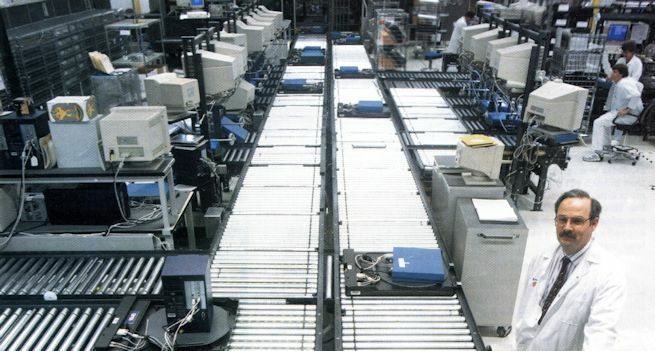 To get the kind of flexibility Silicon Graphics desired in the burn-in operation, would typically require multiple conveyor lanes -- all eating up floorspace. 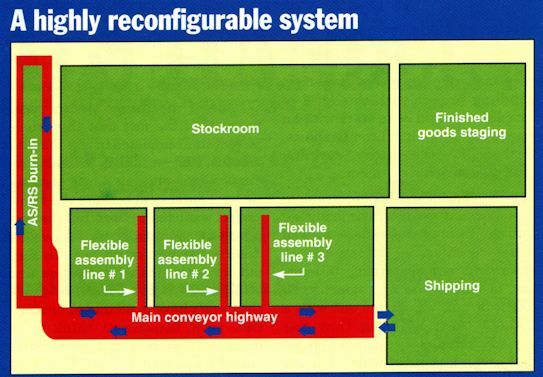 But thanks to the transport pallets, which have a universal connector that simply mates into a connector in each storage bay, this AS/RS is designed to accept any product in any location. Because each storage location is controlled independently, the system can store and retrieve computer products in any sequence required for final configuration and testing. Mullen estimates that the added flexibility has shaved about two hours from the average cycle time. But even more impressive are the hours saved by a watchdog computer that advises the system operators almost immediately of a product failure during burn-in. In the past, a product might have gone through hours of testing before a failure was detected. And in the fast-paced computer market, even a few hours of time can mean the difference between getting a customer order or not. The dinosaurs became extinct because of their inability to adapt to changing conditions. But by making a conscious effort to design adaptability and flexibility into its materials handling system, it is clear that Silicon Graphics plans to be around for a few more millennia. One of the things we are most proud of is the fact that this whole project was completed in less than six months, and we did it without production ever missing a beat. I think we were successful because the whole project was a team effort.